The results, published today (14 August) in Cancer Cell, show that catching and treating breast cancer before it spreads is a realistic goal. It also opens the door to predicting which drugs will work against breast cancer that has already spread. It is estimated that 35,000 people in the UK have metastatic breast cancer. The survival rates are poor: around 15 out of 100 women will survive advanced breast cancer for 5 years or more after diagnosis. The prognosis has not improved in the past 20-30 years. Most of the research into breast cancer has focused on primary breast cancer, and there is little understanding of the biology underpinning breast cancer that has spread to other parts of the body, known as metastatic cancer. This is in part due to the difficulty in acquiring samples of tumours that have spread to other tissues. In this study, scientists investigated how breast cancer evolves from the original tumour in the breast to tumours that have spread, or metastasised. 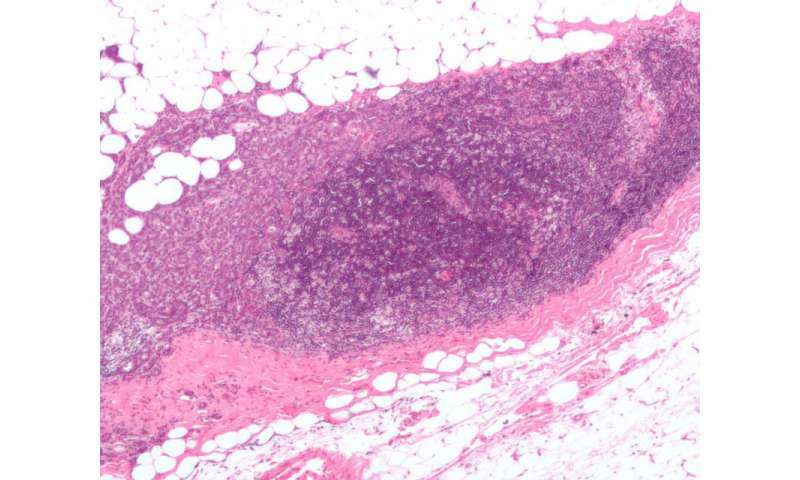 It has been controversial whether the breast cancer cells that spread to other parts of the body break off and leave the primary tumour in the breast at early or at late stages of cancer development. The team found that most of the genetic changes in the original breast tumour were also present in the metastatic tumours, showing that the cancer cells spread late in disease development. This shows promise for breast cancer patients as diagnosing and treating the breast cancer at early stages means there is a greater chance of preventing cancer cells spreading to other tissues, such as the lungs, brain and bone. Dr Lucy Yates, first author from the Wellcome Trust Sanger Institute and Guys and St Thomas' NHS Trust, said: "As the cells that cause the spread of breast cancer leave relatively late, it means they are still quite similar to the cells in the primary tumour. Therefore by studying the genome of the primary breast cancer tumour, in the future we may be able to predict what cells that might have spread 'look' like, and potentially which treatments they will respond to." In the retrospective study, the team sequenced the DNA of 299 tumours from 170 patients with breast cancer that either returned in the remaining breast—local relapse—or had spread - metastatic breast cancer. Researchers found that in the time between breast cancer patients being diagnosed with primary cancer and the diagnosis of metastasis, the breast cancer cells had gained genetic changes, or mutations, that increased the aggressiveness of the tumour. This may explain why metastatic breast cancer is currently difficult to treat. Professor Per Eystein Lønning, joint lead author from the University of Bergen and Haukeland University Hospital in Bergen, said: "Most women who have metastatic breast cancer do not have another biopsy of the cancer, and rarely have it analysed using genetic sequencing. In this study we found that in some cases, the metastatic tumours had particular genetic changes that could be targeted with treatments. We would not have seen these mutations by sequencing the primary tumour alone. Our results suggest that it should be more routine to biopsy the metastasis and have it genetically analysed in order to open up clinical trials of treatment options for metastatic breast cancer." Studies are now open to recruit patients with metastatic breast cancer across Europe - these studies will first extend the analysis performed here to many more patients, but the ultimate goal is to build a platform for identifying an appropriate clinical trial of new treatments for each patient with metastatic breast cancer. The use of whole genome sequencing enables researchers to accurately distinguish between tumour types with different treatment strategies. In one particular case, it was thought a patient had primary breast cancer that had relapsed in the breast. However after sequencing the tumour, the team found it was not a relapse but a second primary breast cancer. Genomic data enabled the scientists to tell these two scenarios apart, which would have changed the treatment philosophy used - this would be difficult using standard diagnostic methods. Dr Peter Campbell, joint lead author from the Wellcome Trust Sanger Institute, said: "Our study shows that in order to catch breast cancer before it spreads, early detection of breast cancer is key, and we provide a good rationale for continuing to improve methods for detecting breast cancer sooner. These results show the power of genetic sequencing in understanding metastatic breast cancer and open the door to personalised treatment for breast cancer in the future."